Berberine 500 mg Supplement | 60 Capsules | Multiple Benefits | Buy Here! Helps reduce blood glucose levels in people with type 2 diabetes. May help improve lipid profiles (hyperlipidemia). Chinese and ayurvedic medicine utilize a number of plants that are still relatively unknown in Western medicine. One such plant is Berberis vulgaris, or European barberry, the berries of which contain a powerful plant alkaloid called berberine. Traditionally used for its immune-stimulant, anti-fungal, and anti-bacterial properties, and its ability to control intestinal disorders, this substance has emerged as a new means of treating type II diabetes and pre-diabetic conditions, incidence of which has been growing rapidly for some years. ¤ Berberine’s mechanism of action essentially relates to the regulation of AMPK-Adenosine Monophosphate activated Protein Kinase. This is a fundamental and ubiquitous enzyme which is involved in normalizing energy metabolism and regulating food intake and sensitivity of tissues to insulin. Thus it plays a key role in certain metabolic diseases such as diabetes and its complications, insulin-resistance, and obesity. • and finally, by increasing production of GLUT4, a glucose transporter present only in muscles and fat cells, it leads to significant improvements in insulin sensitivity. ¤ Such is the extent of berberine’s properties, it can be compared with metformin, a drug widely-used to treat type II diabetes and excess weight associated with glucose metabolism. Furthermore, the most representative studies focus on the efficacy of berberine versus metformin in patients with type II diabetes, whether or not associated with dyslipidaemia. ¤ With properties traditionally-recognised as beneficial to immunity, cardiovascular and intestinal health, berberine also appears to be an excellent, easy to use and well-tolerated nutritional supplement for treating type II diabetes in its early stages, or as an adjuvant therapy. ¤ Research on berberine suggests the recommended daily amount to be between 1,000 and 1,500 mg a day, spread over two or three doses, taken before the three main meals of the day. ¤ In order to benefit fully from berberine supplementation, it should be taken for at least three months, as its optimal activity is only apparent after two weeks’ regular use. 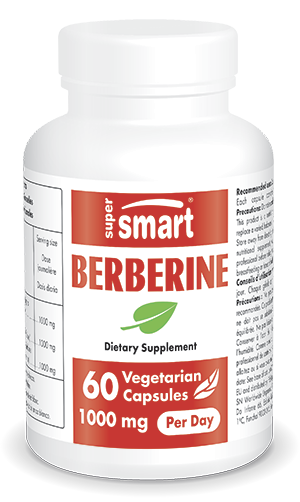 ¤ Apart from a few reported cases of mild, temporary constipation immediately after beginning supplementation, berberine is completely free of side-effects. • lower triglycerides, LDL-cholesterol and total blood cholesterol.